Learn 4 Core fundamental sanity strategies for life-flow and balance for mom entrepreneurs! Gain Life-flow and restore balance back into your schedule! This free video training program is designed as an introduction for work from home mom entrepreneurs desiring work-life balance without burnout… what I call life-flow! This free program will help you whether you are a mompreneur in the business start up phase or are well on your way to growth. When you have a business, you have more to do than most of your friends… and less time! Since I’m a mompreneur too, I’ve learned a ton of valuable tips along the way. As a result, I created this introductory training program to help you get clear and take the right actions to drive your business success. The program is designed to support you in the early startup through growth phases of your business. It will help you focus and define your CORE™ Business Fundamentals and your Sanity Dimensions that keep you sane! C: Customers and Clients – This is probably the least understood aspect of business for people in startup. Because it seems counter intuitive to focus on a small niche, most business owners make the mistake of serving (and marketing to) everyone! But as they say – the ‘riches’ are in the ‘niches’. This program will walk you through how to determine WHO your ideal clients are that will rush to purchase what you are selling! O: Objectives – When you’re in the business start up phase, there are so many things vying for your attention that you often don’t think about being client-focused. 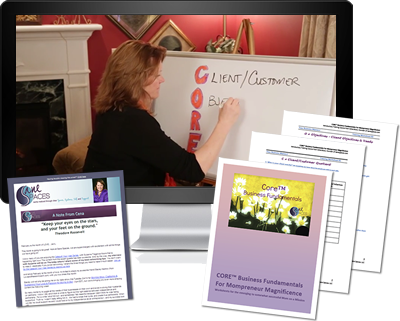 This module explains the second element that makes a mom entrepreneur’s business a success – clarity around your objectives for your ideal client and customers. 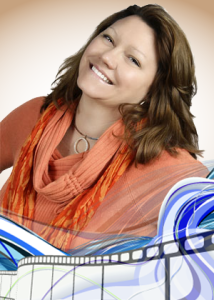 R: Results – The third element that makes a mom entrepreneur’s business a success is therefore YOU and your BIG WHY. Without you and the results you want from your work from home business, you will struggle making time for what is most important to you. This module will help you identify those desired results. E: Expertise – Most of all, you’ll need to build the fourth element into your business somehow! The thing that makes a mom entrepreneur’s business a success is synergized when you blend your expertise and unique brilliance into the mix of your business! In this module, you’ll identify how to incorporate your rich experience, talents and skills into your business offers. Hence, this program guides you through the steps to set your CORE Fundamentals of your business up right from the start. And if your business is already launched, it will help breathe new life into your current operations. Then, when you’ve finished the CORE four business fundamentals, you’ll gain access to even more valuable information! 5 Sanity Dimensions help you tweak all the moving parts of life-flow strategies for your work from home business behind the scenes. If the CORE Four Business Fundamentals are your WHAT and WHY… these five Sanity Dimensions are your business HOW’s! The 5 Sanity Dimensions of life-flow balance help you clarify all the aspects of ‘how’ you do things. Spaces – This module discussed the areas in which you work and live and how important they are to your success! Systems – Any time you have the opportunity to repeat something in business, ink it! Create a system that is repeatable and easy to follow! This module discussed the areas in which you work and live and how important they are to your success! Self-Care – If you are not healthy and able to thrive physically your business may not survive! So, this module covers my favorite Business Sanity Dimension™: Self-care! Determine your critical habits that keep you happy and healthy, and create strategies to stay on track! Support – This element is critical to any mompreneur. We do our best work when we have others on whom we can rely to get guidance, help and assistance! The Support Dimension™ will help you identify the areas where you need the most assistance. Time – This is the final element that rounds the fifth (and final) Sanity Dimension™: Time Management! Managing time as a commodity that you must master to move you forward! Aligning your 4 CORE Business Fundamentals and creating Sanity Dimensions are essential aspects to your success! Clarity in these areas, saves countless hours of work and improves your profits. You’ll be able to serve your clients better, prioritize what is most important and control your time! Efficient systems drive consistent behaviors and help you establish natural habits to stay organized and focused. Efficiency at work provides you with more quality time to spend with your family and friends! Sign up below to find clarity, kick start your business success, and establish the work-life balance you desire! Sign up to get instant access and the accompanying workbook. Daily lessons to guide you through the tips. Stay focused and get systemized with proven sanity strategies that have worked for thousands of work from home entrepreneurs! And the best part is: It’s FREE! !